'Brave New Workers': Ex-West Virginia Coal Miner Now Saves Lives As An EMT The "Brave New Workers" series tells stories of Americans adapting to a changing economy. This week: after years working in the coal mines of West Virginia, a miner charts a new career in health care. After David Wiley was laid off from the grueling day to day of the coal mining industry, he found a new livelihood working for STAT EMS in Pineville, W.V. Growing up the son of a coal miner in southern West Virginia, David Wiley saw the downside of the profession up close. His father had been injured in the mines, lost several fingers and damaged his knees and back. "He was just really beat up," Wiley says. So when it came to find his own line of work, Wiley says he had no desire to work in the coal mines. For a couple of years after high school, Wiley tried his hand at manufacturing and welding jobs in the neighboring state of North Carolina. But when Wiley decided to return to West Virginia in his early 20s, the job opportunities were few and far between, and when he received a job offer to work in the mines for a starting wage of $22 an hour, the pay was too good to pass up. "I was excited," says Wiley, "that's really good money for anybody. A young kid like me, I'd never made that kind of money." Wiley worked the overnight shift, beginning at 11 p.m. and clocking out at 7 a.m. and spent his nights scooping up spilled coal, helping to install structural supports in the tunnel ceilings, and cleaning and maintaining the mine for the next shift. Much of the work was in the dark and it usually involved heavy manual labor. "Everything in the mines is heavy," Wiley says. "The lightest thing is a 50-pound bag of rock dust." Wiley says that for a while, the high pay made up for difficulty of the work, but he says that he soon began to develop pain in his knees and back, and a falling rock injured his foot. Wiley also notes that the grueling hours meant he had little time to spend with his wife and children. "You'd come home and sleep all day. You really didn't have no life," says Wiley. "You're just a walking zombie." The final straw, Wiley says, was the instability of working in the mines. "You can tell when the coal market is up, then you can tell when the bottom drops," he says, "because they start laying people off." For more than five years, Wiley says he shuffled between different mining operations in southern West Virginia, as they opened and closed, riding out the off-periods with savings and by signing up for unemployment. "One mine might work good for a year, then it might shut down," he says. "Then you go somewhere else and it could work for two years, then it might shut down. I worked at one mine, we had over 500 men there at one time and they shut the doors. Five-hundred people lost their jobs ... The last time that I got laid off, the coal market was so down that you couldn't buy a job." Wiley says that the last time he was laid off, he began applying to every minimum wage he could find in the area. "I was willing to take anything and everything," Wiley says. One day, he came across an online job posting for an ambulance driver with STAT Emergency Medical Services in Pineville, W.V. Though he'd never worked in the medical field, Wiley says he was desperate, and decided to apply. He remembers speaking with the company's hiring manager on the telephone, "basically crying because my unemployment was getting ready to run out. I had two babies at the time. I couldn't figure out how I was going to feed them, and he gave me a shot." I was a shock at first, he says, going from having made around $30 an hour to minimum wage work at $8.75. But he needed a way to help support his family, and the constant demand for healthcare in the area meant plenty of opportunities to work overtime. "I've come in at 3:00 in the morning and not gotten off until 3:00 in the morning," Wiley says. He says he knew within his first month that he'd made the right decision in picking his new line of work. "I fell in love," Wiley says. "It's a steady job. You don't have to worry about losing your job, because it's always here." 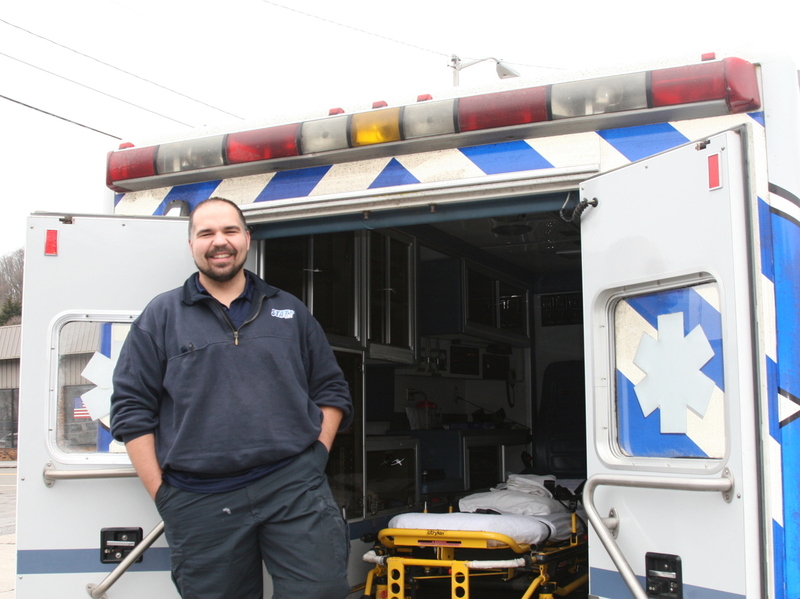 In the two years since he was hired on at STAT EMS, Wiley has graduated from ambulance driver to become an Emergency Medical Technician, and he's currently enrolled in a paramedic science course at a local community college. Wiley plans to continue in the medical field as far as he can. And, despite lower pay, the meaning he derives from his interactions with his patients has made a huge difference in his life. "You pick up somebody, and they're on the verge of death. And you drop them off and they're shaking your hand, saying, 'You meant a lot to me.' " Wiley says, "It makes you feel you're somebody — that's enough payment."